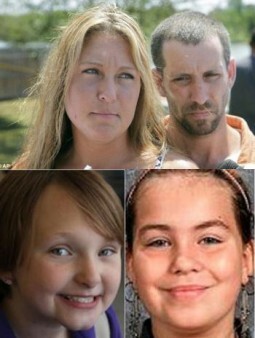 Missing Iowa Girls Lyric and Elizabeth: New Evidence Found, Lake Cleared, Dad Dan Morrissey Is Suspect. Is A Jailbreak Connected? Evansdale, Iowa- Lyric Morrissey and Elizabeth Collins have been missing from what their Grandmother Wylma Cook described as “within her view from the home” for over one week. Myers Lake, approximately a 27 acre body of water surrounded by a Nature bike trail which yielded the tweens bikes and purse, has been cleared after consultation with the Elite FBI CSI dive team. On July 12th, the day before the girls disappeared, Daniel Morrissey was due to enter a guilty plea in a pending Federal drug arrest. Instead, he requested the matter be scheduled/reset for trial. In response, prosecutors swiftly requested the court place Morrissey under appropriate pre-trial supervision for his alleged crimes. On Thursday, prosecutors with the Black Hawk County Attorney’s Office asked a judge to review Morrissey’s release, pointing out that Iowa Code state people charged with conspiracy to manufacture meth being a second offender — one of the charges Morrissey is facing — shall be under supervision as a condition of their release. Occurring almost simultaneously to Morrissey’s plea filing which he did not attend personally, a Black Hawk county prisoner broke out of jail, robbed a pharmacy and was on the lam for over 18 hours. Jeremy Alan Mask, fond of controlled substances which led to his arrests is now in custody and additional charges related to the escape were filed against Mask the following day. Mask was sentenced to a residential treatment center following a burglary of a Walgreens last April. Are the incidents connected? Investigators are not talking. Except to say they now have video footage of the girls at about the time they were both seen. No mention as to whether or not the girls were on their bikes. Investigators may be tight lipped- But they ARE acting. Yesterday Black Hawk County detectives revised a no contact order barring Dan Morrissey from being near his wife Misty- although they have appeared together and have been living together for weeks- following a domestic violence assault which landed both Dan and Misty back in prison last August. As reported exclusively last week on www.blinkoncrime.com, Dan Morrissey for the assault and Misty Cook-Morrissey for extensive probation/parole violations. The pair are now permitted to be in each other’s company, provided LE agents are as well. Misty Cook Morrissey’s sister Tammy Brossueau has confirmed that detectives have directly confronted Dan Morrissey with information they developed pointing to him as a suspect and as a result the estranged couple have refused to cooperate further in the investigation to locate their daughter and her cousin Elizabeth. Black Hawk County Sheriff’s Office Captain Rick Abben officially declared the case an abduction at a 4 PM press conference yesterday afternoon. Abben also announced a $50,000 reward is being offered leading to the person or persons responsible for the disappearance of the girls. He confirmed said evidence has been seized in the investigation and sent to the Iowa Division of Criminal Investigation crime lab in Des Moines. While he would not comment on the evidence specifically, sources inside the investigation speaking on the condition of anonymity to www.blinkoncrime.com have confirmed that items from the home including a computer and other electronic devices are among the listed property inventory.